One thing I dig more than any other product we sell at Gearhead is the Big Turtle Shell Bluetooth Speaker from Outdoor Technology. Really, I'm a fan of everything they make, but the Big Turtle Shell is in a class of it's own when it comes to Outdoor Tech products. If you're familiar with Outdoor Technology, then you'll certainly see some resemblance in the Big Turtle Shell and it's "little brother" the Turtle Shell 2.0. Both are great options if you are looking for a bluetooth speaker, but as they say, bigger is better and that is definitely true when discussing the Big Turtle Shell and it's smaller version. Here are some great features that the Big Turtle Shell offers. Connects using Bluetooth for a fully wireless audio experience. Phone or other device in another room and you still want to jam? No worries. This bad boy connects from up to 32 feet away. Also, if you're away from your phone and want to change the song, change the volume, or answer a phone call it's only one button push away. The built in microphone has come in handy for some customers who do regular conference calls, enabling the entire room to hear clearly. Connecting is easy. Just pull up the Bluetooth screen on your phone or device and choose "Big Turtle Shell". The Big Turtle Shell offers an IPX-5 rating against dust and water, meaning you can go run around with it in the rain and it'll keep on rocking. (We wouldn't recommend submerging it in the lake though.) It is also shockproof, so if you drop it off your balcony just walk on down and pick it up and your song will still be playing just like it was before the fall. This thing packs some serious punch when it comes to power. 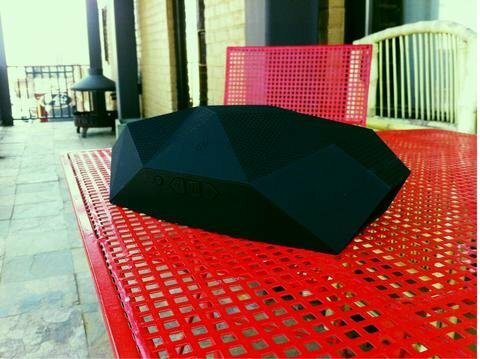 It offers 7800 milliamps of battery power (3x that of the leading Bluetooth speaker box). This power gives you 16 full hours of play time until you have to recharge it. It uses a lithium ion battery, so when the power gets low, just plug it in the wall and you'll be good to go again in no time. How do you know when the power is low you may ask? A voice inside the Turtle Shell will say "battery low" when it's time to charge it back up. Seriously. Oh, and if you're afraid your phone battery will drain quickly when paired with the speaker, fear not. There is a USB port that will charge your iPhone four times using that awesome battery we discussed earlier. It will also charge most other phones three or four times and a GoPro camera six times. Pretty sweet! Want more info about this awesome product? Check out their website at www.outdoortechnology.com. This item is only sold in stores, so find your nearest location!